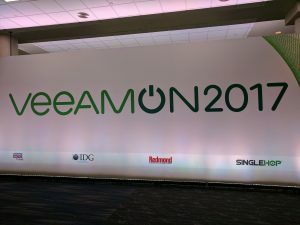 In May 2017 I travelled to VeeamON as a guest of Veeam. Because of the back-to-back conventions, I didn’t need flights from Australia, so Veeam were kind enough to tack on a weekend of hotel stay in New Orleans for me instead. I flew into New Orleans on Friday, rather than spend the weekend in Las Vegas, and this was definitely the right choice. I stayed at the Marriott on Cable Street close to downtown New Orleans, and right next to the French Quarter. I picked up the last couple of night’s stay myself, rather than fly to San Francisco early. It meant I got to spend a couple more days in New Orleans. I fended for myself for the first couple of days, which meant exploring the French quarter. I had a look at a couple of the better rated cafes, but they had monster waits to get in for lunch, and I ended up at The Old Coffee Pot restaurant. It wasn’t quite as special as the website would have you believe (the coffee certainly wasn’t) but they had a tasting selection option that meant I could try three different dishes instead of having to order a full one. I had a gumbo, a jambalaya, and a chowder/bisque and this was the moment I fell in love with gumbo and wanted to have it all the time. On advice from friends, I wandered down into the French quarter and picked up a Muffeletta from the Corner Cafe on Royal Street in the French Quarter. It’s a sandwich of cured meats, olives, and cheese on focaccia style bread and it was delicious, if a little salty. On my way back to the hotel with my whole Muffaletta, I stopped by the Cafe to get some beignets. A beignet is a bit like a chewy donut covered in powdered sugar. They’re made by deep frying folded choux pastry, and have a slight twist to them. They’re quite filling, and sweet, so you don’t need many (you get three in a bag). This combination was both lunch and dinner for me because I’d overestimated how much food I would actually need. A reminder not to shop while you’re hungry. Monday was a pretty domestic day, based in the hotel. There was a coin-op laundromat on level 5, so that made it easy to get a bunch of laundry done without paying hundreds of dollars for hotel laundry to do it. I had intended to get a haircut as well, but I discovered that basically all the barbers in New Orleans are closed on Monday, despite what Google told me about one in a bank building not far from the hotel. So instead I stayed in the hotel room and did a bunch of work while I waited for my laundry to wash and then dry, and ate the last of the Muffeletta and beignets for lunch. The conference begins! Breakfast was #buffetbuffethippo in the press area at the convention centre after picking up my press pass. Standard American buffet style breakfast offerings. I had scrambled eggs and fruit, and snagged a couple of protein bar things for snacking later should time get tight. There was also standard drip coffee. Lunch was in the media area, catered bain-marie style buffet. Forgettable, because I have, though I do recall a conversation with some colleagues from India and the middle-East about what the vegetarian/vegan options were. Dinner was a media reception put on by Veeam at Fulton Alley, a bowling alley Veeam hired out for the night for press and analysts to schmooze. There was various finger food things, including the now-ubiquitous sliders you find at these things. There were some nice chicken wings and some meat wraps (pork? ), but I avoided the oysters they had as they were cooked things and I prefer them raw. The risk of violent dysentery while travelling is also something I’m aware of, though it doesn’t stop me with other seafood, so my risk analysis is pretty flawed. I stuck to diet coke and soda water to drink. I did bowl, and immediately scared some analyst colleagues by getting a strike first go. That was basically the peak of my skills, and it all went downhill from there. My right arm, and left thigh weirdly, were sore the next day, so sticking to two games before calling it a night was the right call. We had a breakfast briefing in the hotel at 7am or something equally early. It was a sit-down we’ll-bring-standard-plates-to-you affair, with some fruit and yoghurt in glasses on the table. Basic American bacon, eggs, fried tomato stuff. The fruit and yoghurt was the best bit. Lunch was another forgettable buffet in the media lounge, though there were some nice cookies this time. 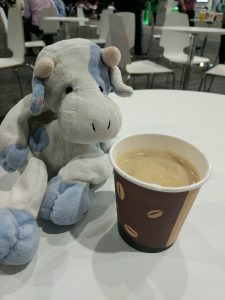 I also discovered that CDW on the show floor were making proper espressos, so I had one of those. Dinner was at a couple of vendor parties held near Fulton Street. I hung out with the Veeam folk for a while at their little do after gatecrashing by accident. I had intended to go into the NetApp party that was next door and went in the wrong entrance, and then one of the VPs (Don Williams) recognised me and got me in as I was about to leave. Being a dumbass has its advantages at times, I guess. After about an hour, that party finished and we all wandered down to the Cisco party around the corner, which had a short and fast-moving line to get in, and was clearly going very well. I had a bunch of conversations and fried-on-a-stick things, and a couple of lime and sodas. I also had a chance meeting with a guy from Austria who I knew only through Twitter via the Tech Field Day community. He was introduced to me because he repairs vintage pinball machines, and needed a special spring that he could order from Australia, but they didn’t ship internationally. He got it sent to me, and I forwarded it on. We just happened to both be at VeeamON, and both at that party. Amazing. And yes, the pinball machine apparently works now. Blue Cow and a CDW provided espresso. Thursday breakfast was in the media lounge at the convention again. Coffee and a couple of pastries, from memory. After the closing keynote I grabbed another halfway decent espresso from the CDW booth on the show floor. Lunch was again the media lounge, another forgettable buffet experience. Dinner was at the Veeam party, which had a large variety of options throughout the venue buffet-style. I had fried shrimp, some brisket, some mac-n-cheese style thing, and late in the evening some tacos from a food truck outside. To drink I had a virgin bloody mary that was pretty blah, so I stuck to lime-and-soda alternating with diet coke for the rest of the night. Lots of good conversations with all kinds of people I knew, plus new people. Saturday breakfast was once again coffee made in the hotel room. For lunch I ordered room service, and had the club sandwich again, and a slice of cheesecake. The sandwich wasn’t as tasty as it was downstairs the week before, so I gather it’s made differently for room service compared to the downstairs bar. For dinner I wasn’t that hungry, as the I just wandered up the street a bit and had Popeyes chicken. When in Rome, right? I was underwhelmed, which wasn’t a surprise, but sometimes you just need to confirm your suspicions. A travel day, this time to San Francisco. My flight was early-ish, but not so early that I couldn’t have a coffee before leaving. My second flight ended up getting cancelled, so my 2:15pm flight out of LAX became a 4:30pm flight or something and I spent 6 or so hours in LAX airport. I had a burger for lunch in a sports bar thing in the airport which was tasty enough. I made it to the hotel in Redwood Shores at around 10 at night, so I had a shower and went pretty much straight to bed. The next week will be in my Oracle Cloud Day disclosure post. Veeam gave us all a conference bag and an unbranded insulated aluminum water bottle. On the day two keynote, we all had a copy of Zero Day by Mark Russinovich on our chairs as he was presenting. I grabbed two copies so I could read one on the several plane(s) ahead and give one away that was unscathed. It’s not bad. I picked up a flying monkey toy from the Microsoft booth. It makes noise like a monkey screeching when it hits something. I immediately regretted giving it to my son for this reason. KnoxLabs was giving away Google Cardboard viewers, and since I’d just bought a Google Pixel phone, I was keen to give it a try. It’s really neat! You still look like a huge tool while looking at VR through a headset, but you don’t have to look at you so you don’t care so much. I have used this a total of three times and now it lives on a shelf somewhere. It did make me want to shell out for a VR headset for gaming, though. 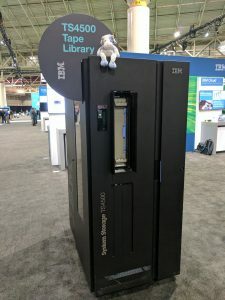 I got a photo of Blue Cow on top of an IBM TS4500 tape library.